It would have been hard to not to spot the Keep Out — Building site signs on the Rangiatea Church gates in recent weeks — but they are down now and the total re-paint job is complete. Rangiatea Church Vestry Chairman for the past four years, Alec Hughes, says for some time the committee had realised the church needed repainting. 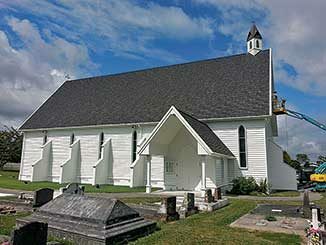 The historic original Rangiatea Church was built in 1851 under the guidance of Ngati Toa and Raukawa Rangatira, Te Rauparaha. In October 7, 1995 a fire lit by an arsonist completely destroyed the former historic church and following consultation with the people a replica was rebuilt and opened in 2003Alec says “It is exciting the paint job is now finished”. He’s especially pleased with the services of “our local expert painters” Phil Winiata and Kevin Mudgeway of European Plasterers and Painters. Reflecting now Alec is astounded that it was at a Vestry planning meeting of just a year ago when they set the series of tasks and objectives needed to get the work done. The starting point was attending a Kapiti Coast District Council workshop to find out how to go about seeking funds for Charitable Trusts and they settled on the Lotteries Commission. The vestry committee applied for $36,000 — the total cost of the job — and were granted $14,000 inc gst. He says one task which was able to be done while the work was going on was getting local builder Ranier Johnson to repair the deteriorating buttresses. Also local accountant, Rod Agar, was a guarantor on the church bills until the grant was fully secured. Alec says he had watched every step of the job done by Phil and Kevin from the time they started on January 12 until they finished March 13 and the Vestry were very pleased with the high standard of workmanship and professionalism they have shown. For most of the church, the preparation, primer and the two top coats were done with the aid of trestle scaffolding. However, a cherry picker was needed to reach the end gables and belfry. “I believe the job will last at least 20 years”, Alec said. He wanted to especially thank the Vestry members for their help and encouragement and for the Otaki community who continued their support and used Rangiatea for funerals and other services. He also wanted to thank Kaye and Michael Carkeek who always do the fantastic job of mowing and keeping the church grounds looking wonderful. The church is open for Eucharist Service every Sunday at 9 am. Everyone is welcome.